Virtual visitors to the Smithsonian’s National Zoo’s website will soon be able to watch naked mole-rats on two live webcams broadcasting the activities of the small, blind, subterranean-dwelling rodents. The new webcam is focused on a behind-the-scenes tunnel that links the different chambers of the naked mole-rats’ exhibit together and it is one of the busiest spots in the colony. It will go live tomorrow, April 12 at 11 a.m. ET. 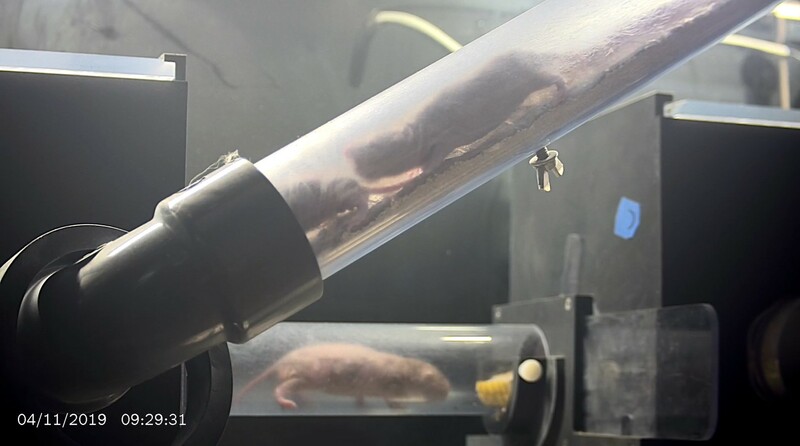 The original live webcam placed in one of chambers of the colony’s tunnel system was launched in August 2018 as part of the brand-new naked mole-rat exhibit. More than 125,000 website visitors have tuned in since it launched in August 2018. Viewers will be able to toggle between the webcams to decide which cam they would prefer to watch. The only other species at the Zoo that has webcams visitors can toggle between is the giant panda. In celebration of the second live webcam, the naked mole-rats will receive some Game of Thrones-themed enrichment. Naked mole-rats are eusocial mammals (live in a colony) and their social structure can sometimes lead to bloody campaigns for the throne, not unlike those on Game of Thrones, which has its final season premiere this weekend. A naked mole-rat colony has one queen. She is the only breeding female in the colony and the rest of the mole-rats have different roles to protect the colony and help care for her pups. If a colony is in the process of selecting a queen, fights known as mole-rat wars can break out and they can occasionally be bloody. If another female in the colony wants to become queen, she can do so by killing the current queen. When the Zoo’s naked mole-rat colony first arrived in 2018, they were in the process of selecting a queen. One female was larger than the other mole-rats in the colony and appeared to be the frontrunner for taking the “throne.” In December 2018, she officially became queen after she had her first litter of four pups. Since then, she gave birth to eight more surviving pups in March. During the process of selecting a queen, four naked mole rats died in fights. Fights between mole-rats when a colony is slightly less stable, such as the time when they are selecting a queen, are normal for the species in zoos and the wild. Naked mole-rats are only one of two mammalian species that are eusocial. All of the other members of the colony are workers. Naked mole-rats are native to eastern Africa and are listed as a species of “least concern” by the International Union for Conservation of Nature. Their burrows and tunnel systems are found in grassy and semi-arid regions in Ethiopia, Somalia, Kenya and Djibouti. The naked mole-rats, including the pups, live at the Small Mammal House. It is open from 9 a.m. to 4 p.m. The naked mole-rat cams broadcast a live look at the colony 24 hours a day. The Zoo will provide updates on the colony on Facebook, Twitter and Instagram using #GameofMoleRats. Naked mole-rat fans can purchase a limited-edition naked mole-rat Adopt a Species package from Friends of the National Zoo. The package includes two 9-inch stuffed animals, a postcard and a certificate.